Home / FT Lite/ Graze-ing in the streets! 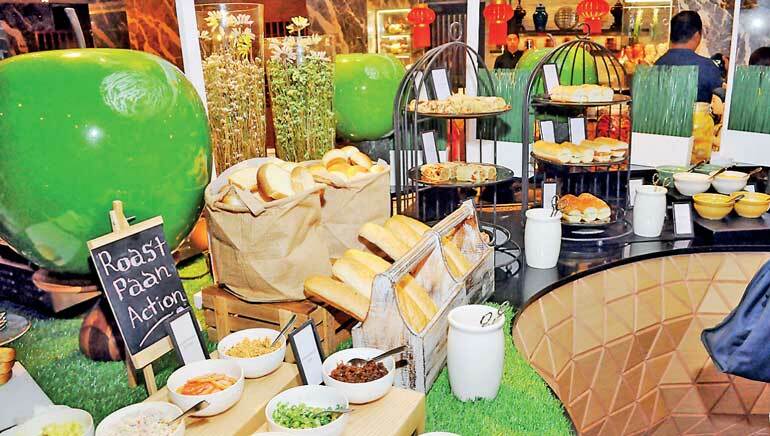 The Hilton Colombo’s Graze Kitchen, continuing its now trademark dedication to variety, has begun celebrating all those decadent roadside treats we all crave at its weekly Hawker’s Market. 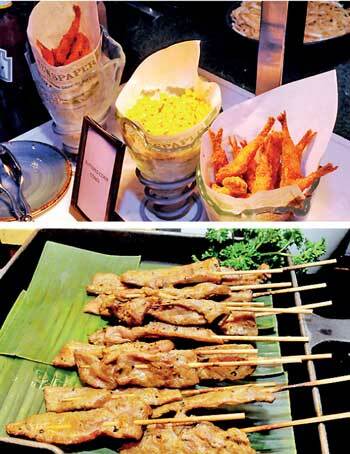 Every Monday night Graze’s array of food stations transforms into food stalls featuring beloved street delights from around the world. The stations capture your attention from the moment you enter. There are churros and crepes being served to the right, while a station on the left is a riot of colours and fruits, serving a Malaysian dessert – Ice Kacang. Move a bit further in for more familiar sights – the Western section with hotdogs and burgers front and centre, or some favourite sweet treats such as Jalebi or its local variant Pani Walalu. Now Daily FT has long held a soft spot for the food served up at Graze and its uncanny knack of burrowing to the heart of any cuisine, so it was interesting to see how its selection of world-class chefs would tackle some of the more mass market delicacies. While we recommend that you try as many dishes as possible, for the purpose of this review we will focus on the handful that must not be missed. The first, and possibly the best, is the lamb kebab. Displayed prominently on a vertical rotisserie, the meat is extremely flavourful. Ask the Turkish chef at hand to make you a neat pita sandwich filled with veggies, excellent yoghurt and mint-based sauces, and that oh-so-delicious lamb. On the Indian side, several dishes will be familiar to Sri Lankans but one dish in particular stands out, mainly due to its unassuming nature: the chicken paratha, featuring flavours that will leave you wanting more. The Italian section provides more flair and unpredictability, serving up dishes such as ‘Curry Arancini,’ ‘Crumb fried Agnolotti’, and ‘Lamb Piadina’. Each delivers in its own unique way, with the Arancini in particular – a rice ball stuffed with meat, mozzarella and peas, and then coated with bread crumbs before being deep fried – standing out. In the Thai section items such as the Prawn Pad Thai or Pineapple rice blur the line between street food and local cuisine due to their prevalence in a host of Thai restaurants in the country. That said, the Pad Thai was definitely one of the better ones I’ve had, with the spicy kick at the end quite unexpected yet refreshing. Elsewhere the Japanese and Chinese sections were limited to a handful of dishes done well; there is a Chinese dim sum trolley that makes its way around the restaurant with regularity, offering a host of dumplings and soft buns to seated patrons, while the small Japanese counter focuses primarily on a delicious braised chicken – served with a sweet teriyaki sauce on a bed of steamed rice. There’s also the Tamagoyaki – a slightly sweet omelette – and Okonomiyaki – a Japanese savoury pancake – offering up some vegetarian options. The Sri Lankan section offers up a host of expected items. Hoppers, fish and vegetable rotis, and kottu roti are all available. What truly steals the show though is the excellent ‘aachcharu’ station; with a selection of no less than 10 fruits to choose from, it is truly not to be missed. Amidst the stations there are also many Vietnamese and Thai salads, while paninis and wraps are neatly stacked in the salad section. With pulled pork, seafood, tandoori chicken, spicy beef, and cheese and tomato some of the options, choices are aplenty. Be sure to ask a nearby chef to grill them for you before setting off back to your table. 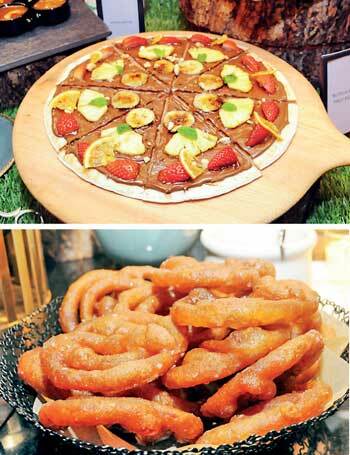 Moving on to the sweet items, the few that immediately stand out are the Nutella Pizza – no prizes for guessing what that tastes like – and the Ice Kacang. The latter is a Malaysian dessert which you might be tempted to forego on first sight. A tip: Don’t. The dish comes made of shaved ice but bathed in coconut cream, with different fruit cocktails and dressings. We had the surreal choice of sweet potato and potato, alongside (a variety of) jelly, mango, lychee, and peanuts, among other items. Provided you don’t pick completely unsuitable flavour parings, this is definitely a dish likely to be enjoyed by all. There are of course several other notable mentions that we won’t get into here, but are definitely worth trying, such as the churros and crepes. On the whole at Rs. 2,888 nett per person, Graze Kitchen’s Hawker’s Market is a value proposition in terms of quality and variety unlikely to be matched anywhere else in Colombo!